The Nissan Pathfinder I use to go to work is year 2000. It works very well. The steering wheel is very light on the turns. No steering fluid check up needed. The radiator sometimes needs more water. The car spends a lot of gas per mile. Like 16 miles per gallon. Tire change happens rarely although I am aware of the tire health. I worry about tire health. The car wattles at 65 + mph. This is due to a car accident I had in the year 2008. The car has overheated a couple times due to my negligence. Once the radiator exploded on a trip to big bear mountain. Although I put water in the radiator before I left to big bear mountain. The radiator exploded when I was climbing. Overall it's a nice car. I love the comforts, the heated seats, the sunroof & the leather seats. The ac & heat work right away & I haven't had any problems. The back seat is comfortable for long rides & the trunk space is huge. I also like the cover I can pull over items in the back. I can also put the back seats down to make more room in the back. 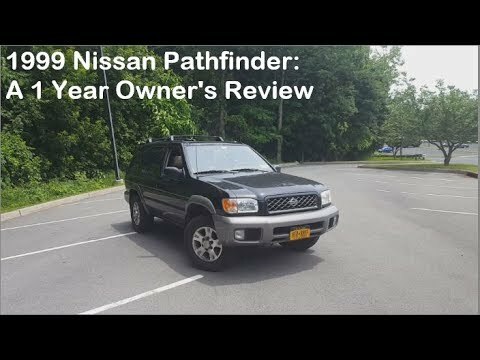 Nissan pathfinder has been very reliable only issues had are due to user error. The Nissan pathfinder has been reliable since the beginning. The only faults I have had with it were due to user error, hahahaha. My window switch stopped working a while back but that is not too big of an issue to deal with. It gets great gas mileage especially in my small town.